The Bundelkhand region of Uttar Pradesh conjures up a picture of poverty and backwardness in the minds of most people. The area has lagged behind agriculturally and economically due to its typical geographical terrain and climatic conditions. The UP part of Bundelkhand comprises of seven districts falling under the Jhansi and Chitrakoot divisions respectively. 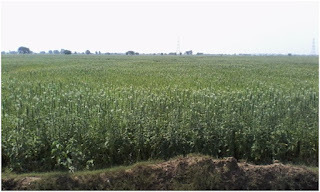 The rabi crop is good here and high value crops like gram, lentil, pea etc are grown in the area in large quantities. However, the farmers of the region have largely depended on one just one crop; the area sown during kharif is much smaller. Traditionally, in comparison to the area sown during Rabi, farmers cultivate only about 50% of the area during the season of Kharif in Bundelkhand. While the net cropped area during Rabi is approximately 18.50 lakh hectares, the area cropped during Kharif has hovered around 9 lakh hectares. The primary reason given is that the region suffers due to Anna Pratha. This is a traditional system under which people leave their milch cattle unfettered to graze in the fields. These cattle eat up the crops and therefore the farmers are not inclined to sow their lands during the season of Kharif. This does not happen during the rabi season as he farmers keep their cattle at home. To understand this phenomenon, one has to appreciate the peculiar circumstances prevailing in Bundelkhand. Firstly, the entire area has traditionally been rainfed and suffers from shortage of water. Due to the vagaries of monsoon, the farmers have preferred not to sow their fields. Secondly, the average size of the landholdings in the region has traditionally been much bigger as compared to the average landholding size of the state due to the low population density here. Therefore it was possible for the farmer to make do with even one good crop in the past but not so any longer. The situation has now changed with the increase in population and the size of average landholdings has gone down substantially in this region also. Thirdly, due to the area being rainfed, there is a general shortage of fodder also in the region during the summer season. This forced the farmers to leave the cattle free to survive on whatever came their way in the fields. This slowly became an accepted practice and farmers stopped sowing their fields during the Kharif season in Bundelkhand. Such vast area remaining uncropped is also a national wastage of sorts for the country. During last two seasons of rabi, due to unseasonal rains and hailstorm in Bundelkhand, farmers suffered severe losses in 2014 and 2015. The coverage of farmers under crop insurance in Bundelkhand is to the tune of 15%, which though much higher than the state average of 4-5% is still very small. As the farmers are mainly dependent on the proceeds from Rabi in the region, this was a big jolt for them. They were desperately looking for some additional income, when the state government stepped in with a unique policy announcement. 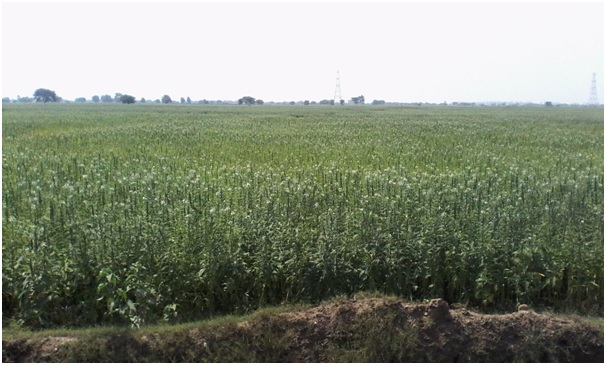 Realizing the potential of cultivation of sesame (til) in Bundelkhand during kharif, the subsidy on its seeds for the farmers of the region was increased five times from Rs. 20/kg to Rs. 100/kg. The decision to promote sesame was taken consciously in the light of the fact that the cattle do not eat this crop. Sesame seed was procured in large quantity to be distributed to the farmers of the area. An aggressive campaign to promote sesame cultivation during kharif was launched. Departmental officers, NGOs, district and divisional officers and all others concerned campaigned actively for increasing the area under sesame and also for generally bringing more area under coverage as compared to the last year’s figure. The result has been extremely encouraging. As compared to kharif 2014, an additional 2 lakh hectares has been cultivated in Bundelkhand this year, out of which almost 1.25 lakh hectares additional area is under sesame! The premise that if farmers are able to get proper return from their crop then irrespective of Anna Pratha they would plant crops, has turned out to be correct! This has been made possible with the active intervention of local administration. During my recent visit to Jalaun district, the farmers were thankful to the administration for restricting those farmers who used to leave their cattle unfettered to graze in others’ fields, which has resulted in the increased coverage. Along the Orai-Jhansi highway, it was a treat to watch kilometres and kilometres of sesame on both sides. The arrangement of fodder for the cattle is also a crucial issue, which definitely needs to be addressed. If the farmer has the purchasing power, he can definitely buy the required fodder from the market. The economics of sesame cultivation is revealing. It is a crop meant for the rain fed areas. There is no dearth of market for the produce as there are very few countries cultivating sesame whereas almost every country consumes it in some form or the other. Sesame oil is used for cooking, making sweets, massage, medicinal and cosmetic purposes and many other uses. Sesame seeds are used for preparing sweets like gajak, rewari, laddoos and tilkut in India, tahini sauce in Middle East and on top of buns and burgers in the west. It is also used for different rituals on religious occasions. Sesame gets a better price for the farmers than the other oilseeds in the market. This episode reminds one of the story of Alibaba and forty thieves. When Alibaba said “Open Sesame”, the mouth of the cave would open up showing a hidden treasure of wealth. This is an “Open Sesame” moment for Bundelkhand, a real turning point. Due to the highly deficient rainfall, the returns this year to the farmers may not be very lucrative but it holds tremendous hope for the future. The pattern of agriculture during kharif may have changed in the region for ever.